A few month hiatus from this blog turned into five and a half years, but that is a much longer story. This one is about the state of desktop spherical displays in 2018. 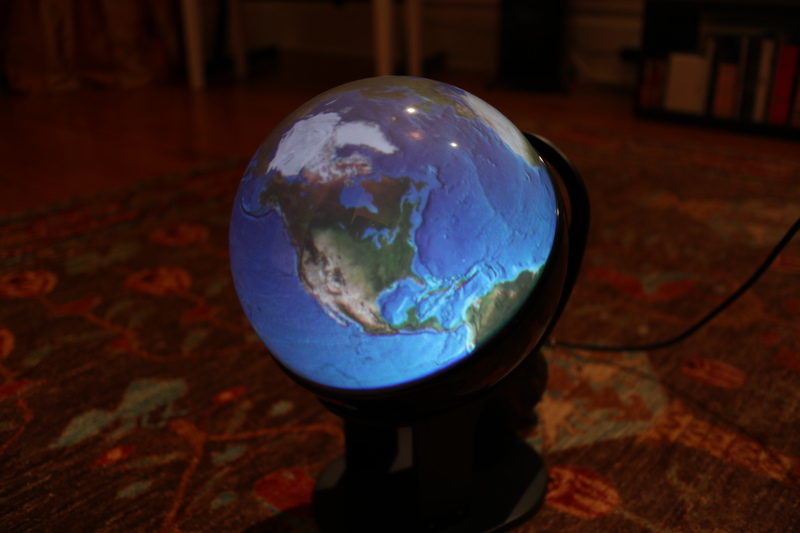 In 2011, I hacked together the Snow Globe spherical display from a laser pico-projector, an off the shelf fish-eye lens, a bathroom light fixture, and some shader code. I had hoped to make it easy for folks to build their own version by publishing everything, but the lens ended up being unobtanium. Judging by the comments on the post, nobody was able to properly replicate the build. A few months ago Palmer Luckey gave me heads up that a company called Gakken in Japan had a consumer version of the idea and that like everything in the world, there were sellers on eBay and Amazon importing it into the US. The Gakken Worldeye sounded like it could fulfill the dream of a desktop spherical display, so I bought one to use and another to tear down. 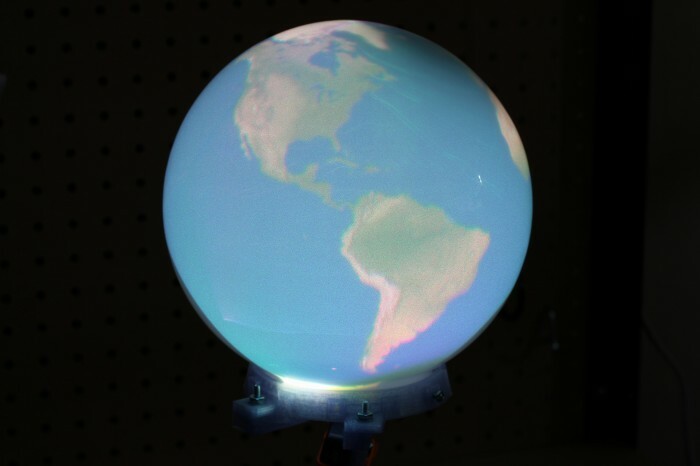 It ended up being a hemispherical display with a pretty decent projection surface but a terrible projector and even worse driving electronics. The guts of the sphere are above. There is a VGA resolution TI DLP that is cropped by the lens to a 480 pixel circle. The Worldeye takes 720p input over HDMI, which is then downsampled and squashed horizontally to that circle by an MStar video bridge. Between the poor projector resolution and the questionable resampling, the results look extremely blurry. 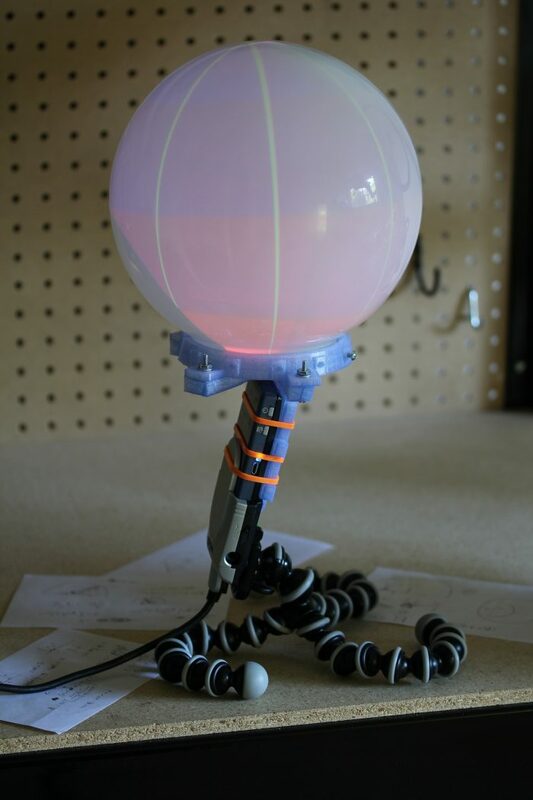 I figured it would be possible to improve on the sphere by taking advantage of the display surface and lens and swapping out the projector and electronics. 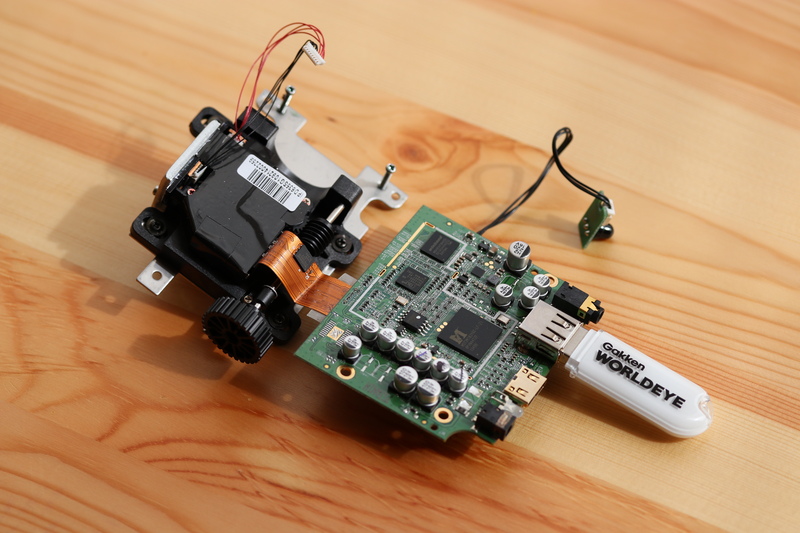 In the time since the ShowWX used in the Snow Globe was released, Microvision has developed higher resolution laser scanning projector modules in conjunction with Sony and others. I picked up a Sony MP-CL1 with one of these modules, which is natively 1280×720. This should have been a decent improvement over the 848×480 in the ShowWX. I then CAD’d up and 3d printed a holder to mount it along with the original Worldeye lens into the globe. The results are a bit underwhelming. The image looks better than the stock Worldeye, but still looks quite blurry. I realized afterwards that the sphere diameter is too small to take advantage of the projector resolution. At around a 5″ radius, the surface of the sphere is getting around 1.8 pixels per mm (assuming uniform distortion). The laser beam coming out of the projector is well over 1 mm wide, and probably closer to 1.5mm. This means that neighboring pixels are blending heavily into each other. The lens MTF is probably also pretty poor, which doesn’t help the sharpness issue. If you’re interested in trying this out anyway, the .scad and .stl files are up on Thingiverse and the code for the Science on a Snow Globe application to display equirectangular images and videos is on GitHub. The conclusion to the opening prompt is that spherical displays are more accessible in 2018 than they were in 2011, but don’t seem to be any better quality. Hopefully someone takes the initiative to solve this. I’ll have more detailed posts about the Adjacent Reality Tracker in the future, but here is a preview of some of what you can expect to see at our booth in Fiesta Hall at the Bay Area Maker Faire on May 19th-20th this year. In the meantime, you can follow Donnie and I working on the thing at GitHub. Science On a Sphere is a NOAA project typically using four projectors to display planetary data on a six foot diameter sphere. As a federal agency, NOAA publishes data that is not copyrightable. These public domain datasets are pretty impressive, ranging from plate tectonics to solar storms. They are also insanely high resolution, with mp4 videos and jpg images at 2048×1024 and 4096×2048. To shrink this four projector, five computer, high resolution science center exhibit down to a picoprojector, old laptop, bathroom lighting fixture setup, I had to move beyond my unoptimized python scripts to SDL, OpenGL, libvlc, and GLSL. I wrote a program called sosg, Science On a Snow Globe, which reads in images and videos and displays them in the correct format for Snow Globe. Doing the equirectangular to fisheye transform in a fragment shader is extremely lightweight, even with GMA graphics. Using libvlc makes video decoding quite performant as well, despite the resolution. The program is the closest I’ve written to “shippable” in recent memory, but there are some rough spots. I ran into a bottleneck trying to decode high resolution jpgs in real time, so currently sosg does not support the image slideshows that the full size SOS does. It also doesn’t attempt to read in .sos playlist information. Basically, it is not an SOS replacement, just a cheap and cheerful way to view planetary data on your desktop. Unlike the original, it is also available under a permissive license and can be cloned directly from git://github.com/nrpatel/SnowGlobe.git. Since reading Snow Crash, I’ve been drawn to the idea of having my own personal Earth. 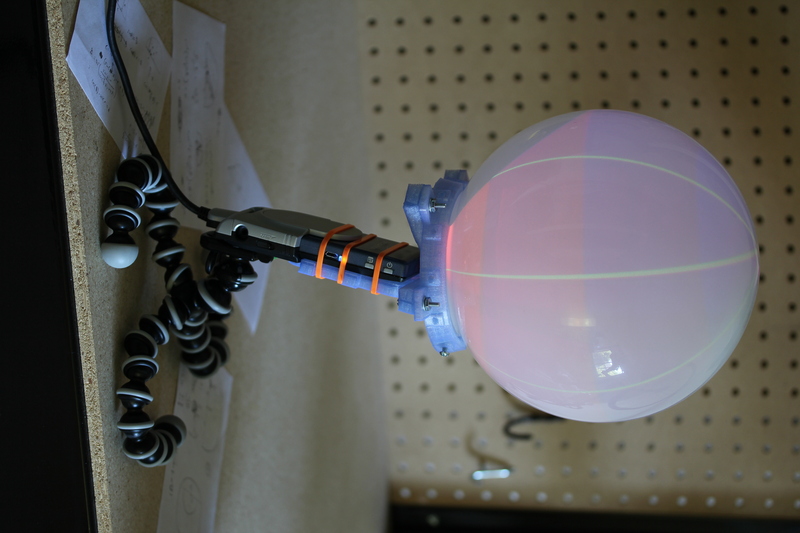 Because I’m stuck in reality and the virtual version of it is always 5 years away, I’m building a physical artifact that approximates the idea: an interactive spherical display. This is of course something that exists and can likely be found at your local science center. The ones they use are typically 30-100″ in diameter and cost enough that they don’t have prices publicly listed. 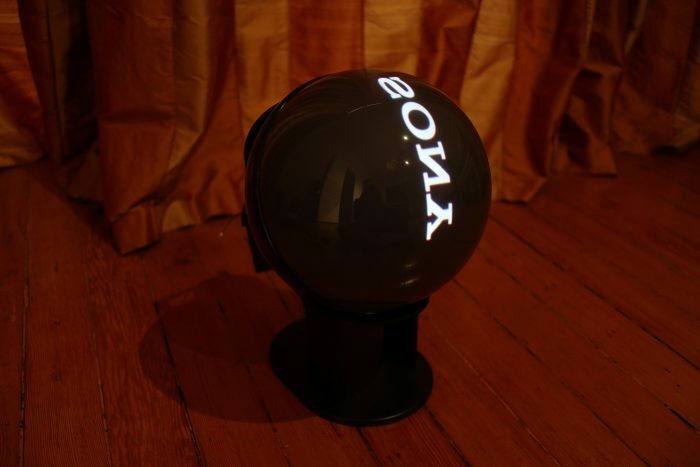 Snow Globe is my 8″ diameter version that costs around $200 to build if you didn’t buy a Microvision SHOWWX for $600 when they launched like I did. The basic design here is to shoot a picoprojector through a 180° fisheye lens into a frosted glass globe. The projector is a SHOWWX since I already have one, but it likely works better than any of the non-laser alternatives since you avoid having to deal with keeping the surface of the sphere focused. 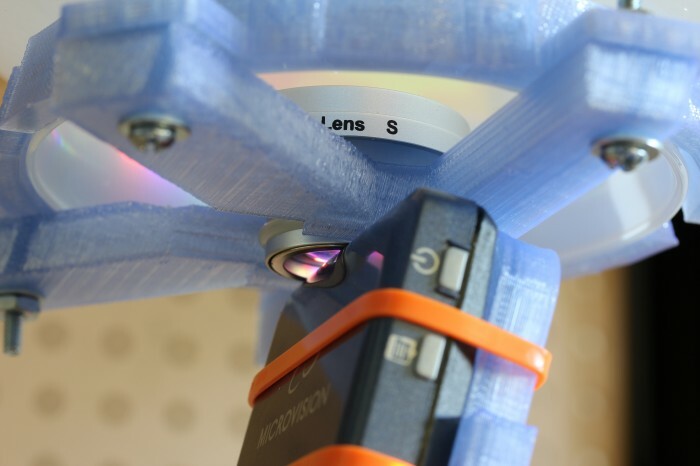 Microvision also publishes some useful specs, and if you ask nicely, they’ll email you a .STL model of their projector. The lens is an Opteka fisheye designed to be attached to handheld camcorders. It is by far the cheapest 180° lens I could find with a large enough opening to project through. The globe, as in my last dome based project is for use on lighting fixtures. This time I bought one from the local hardware store for $6 instead of taking the one in my bathroom. I’ve had a lot of fun recently copying keys and people, but my objective in building a 3D printer was to make it easier to do projects like this one. Designing a model in OpenSCAD, printing it, tweaking it, and repeating as necessary is much simpler than any other fabrication technique I’m capable of. In this case, I printed a mount that attaches the lens to the correct spot in front of the projector at a 12.15° angle to center the projected image. I also printed brackets to attach the globe to the lens/projector mount. The whole thing is sitting on a GorillaPod until I get around to building something more permanent. Actually calibrating a projector with slight pincushion through a $25 lens into a bathroom fixture attached together with some guesswork and a 3D printer is well beyond my linear algebra skill, so I simplified the calibration procedure down to four terms. We need to find the radius in pixels of the circle being projected and the x and y position of the center of that circle for starters. The more difficult part, which tested my extremely rusty memory of trigonometry is figuring out how to map the hemisphere coming out of the fisheye lens to the spherical display surface. For that, we have a single number for the distance from the center of the sphere to the lens, in terms of a ratio of the projected radius. The math is all available in the code, but the calibration script I wrote is pretty simple to use. It uses pygame to project longitude lines and latitude color sections as in the image above. You use the arrow keys to line up the longitude lines correctly to arrive at the x and y position, plus and minus keys to adjust the radius size until it fits the full visible area of the sphere, and 9 and 0 to adjust the lens offset until the latitudes look properly aligned. What you end up with is close enough to correct to look good, though as you can see in the images, the projector doesn’t quite fit the lens or fill the sphere. The script saves the calibration information in a pickle file for use elsewhere. 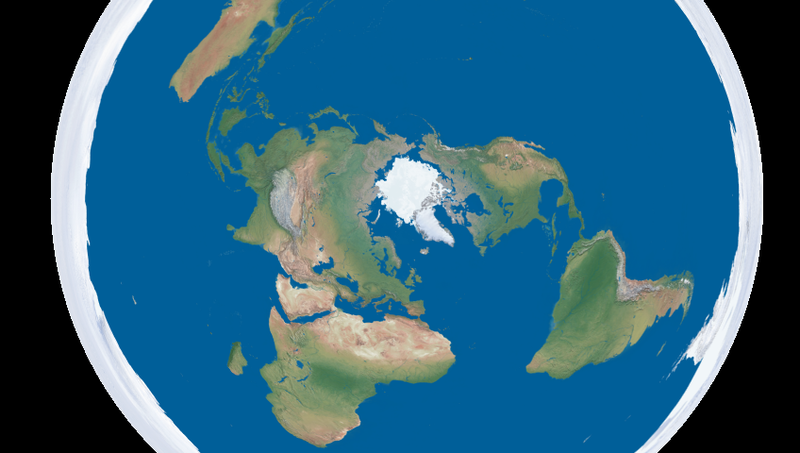 Going back to the initial goal, I wrote a script to turn equirectangular projected maps of the Earth into roughly azimuthal equidistant projected images calibrated for a Snow Globe like the one above. There are plenty of maps of the former projection available freely, like Natural Earth and Blue Marble. Written in python, the script is quite slow, but it serves as a proof of concept. 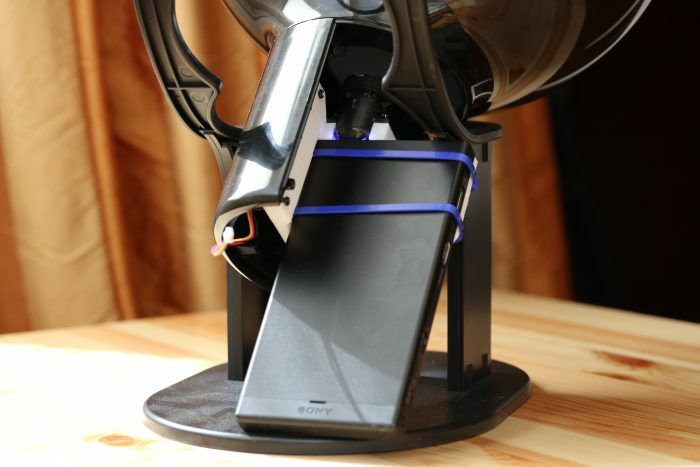 The script, along with the calibration script and the models for the 3D printed mounts are all available on github. I’ve finally fully accepted git and no longer see a point in attaching the files to these posts themselves. I put a Part One in the title to warn you that this blog is going to be all Snow Globe all the time for the foreseeable future. Up next is writing a faster interface to interactively display to it in real time, and if I think of a good way to do it, touch input is coming after that.